The Soviet SU-122 self propelled howitzer was not designed to engage German tanks. This is a common misconception. Also it preceeded the SU-100 by nearly two years. 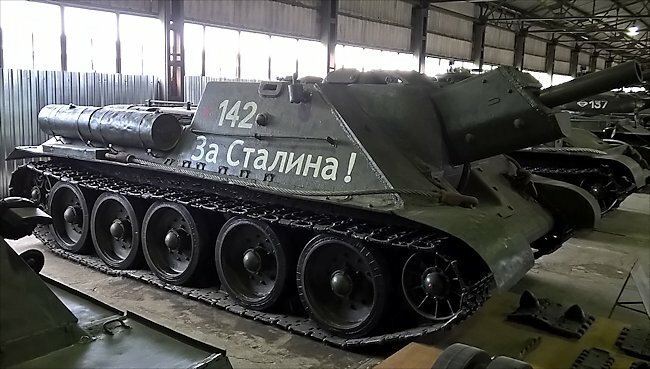 Restored SU-122 Russian Soviet self propelled artillery howitzer WW2 assault gun can be found at the Kubinka Tank Museum in Russia. The SU-100 was designed as a tank destroyer and first saw action in the Autumn of 1944. 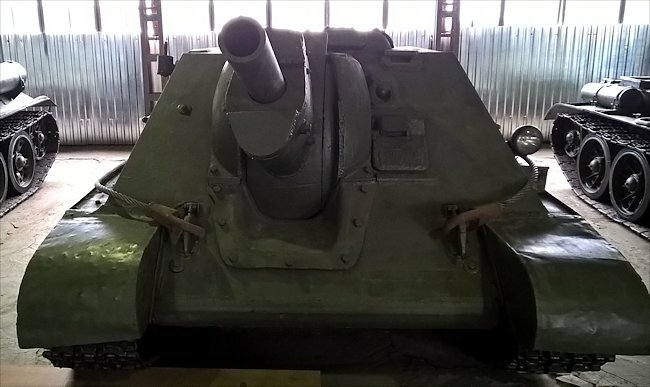 The SU-122 was designed as an enemy fortification busting infantry support assault gun that fired high explosive HE rounds not armour piercing shells. It became operational in January 1943. It weighed 30.9 tonnes and was powered by a Diesel Model V-2 500 PS engine that produced 493 bhp. It had a maximum road speed of 55 km/h (34 mph). It had an operational range of 300 km (186 miles). The SU-122 was fitted with a 122mm M-30S Howitzer. A design flaw was that it was not fitted with a machine gun for self-defence. The crew had to rely on their own personal issue hand guns and supporting infantry units. In common with the German 88mm Ferdinand tank destroyer the Russian designers failed to fit a hull mounted machine gun for self defence. It was never envisaged that the SU-122 would be in the front line of any attack. The crew would have to rely upon supporting infantry units to provide protection from German panzergrenadiers. The only concession they added to the design was a few firing holes out of which the crew could poke their hand guns. When not is use these holes were covered by a metal plug that was attached to a chain. 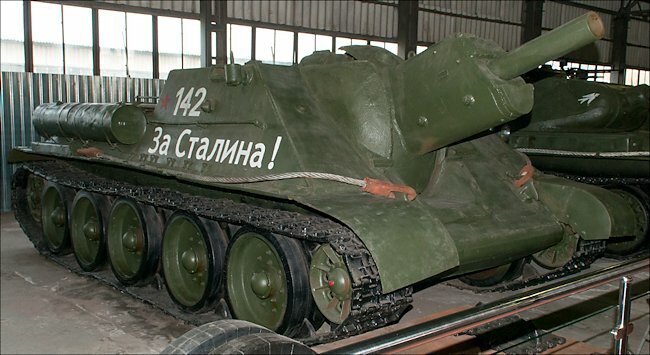 No hull mounted machine gun was fitted to the SU-122 by the Soviet designers. The design of the SU-122 was based on the T34 tank chassis where as the SU-152 used the KV-1 tank chassis and the ISU-152 used the IS-1 tank chassis. The successful use by the German Army of the cheap to produce StuG III assault guns initiated the Soviet High Command to call for the development of their own assault guns. Three main designs were submitted that would eventually become the SU-76, SU-122 and SU-152. SU-122 SPG's were organised in medium self-propelled artillery regiments that consisted of four batteries. Each battery was equipped with four SU-122s. Each regiment was issued with an additional SU-122 to act as a command vehicle that was fitted with extra mapping and communication equipment. By 1944 SU-122s started to be replaced by SU-152 and ISU-152 heavy howitzers. The SU-122 was effective as a direct fire weapon against enemy fortifications. Although it was not designed to destroy German tanks, if surprised the crews could use their main gun to knock them out but only at short range. The concussion caused by a direct hit of a 122mm HE round could damage even the armour of a Panther or Tiger tank. A good German tank commander would never get too close to a SU-122. He would try an pick them off at long range. He would not have this luxury if he encountered a SU-122 in an urban environment like in Leningrad (St Petersburg) or in Stalingrad. 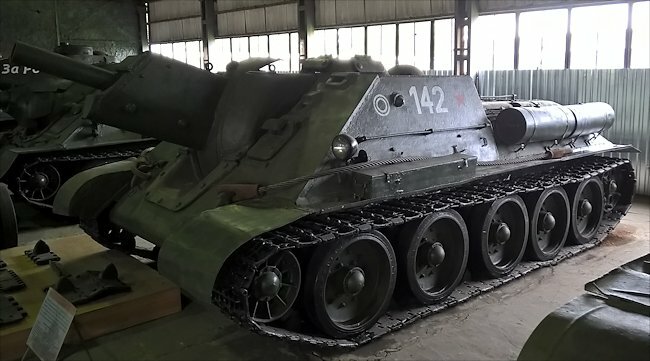 Where can I see other restored SU-122 SPGs?